The Green Retreats Group specialise in the design, manufacture and supply of high quality, year-round garden studios and offices. VI work with Green Retreats on a range of digital, design and print solutions. 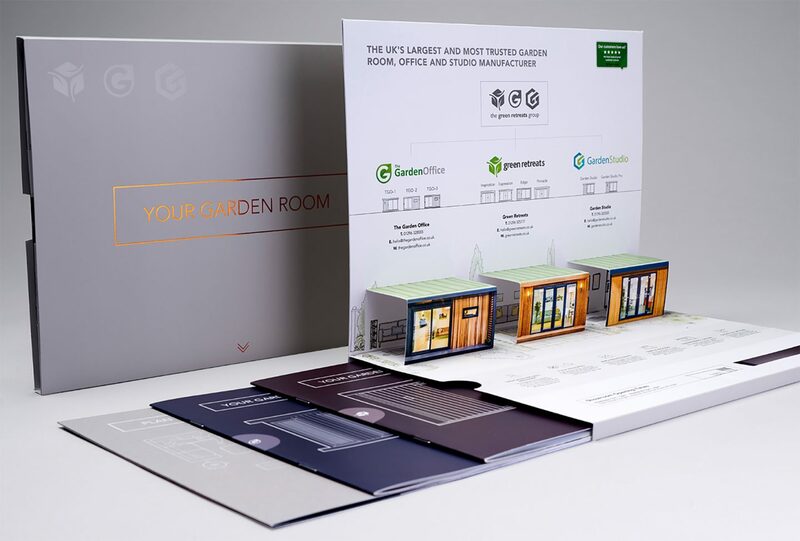 VI delivered a brand solution for Garden Studio, part of the Green Retreats Group, that is fresh and vibrant. 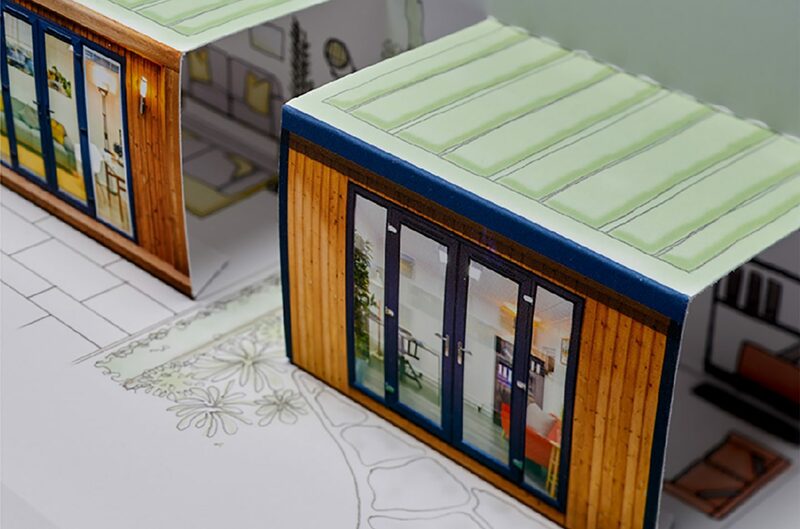 It has a geometric design and reflects the shape of the garden studios and offices. The challenge was to create a customer journey unique to the marketplace. This high-quality pack presents the brand options clearly and engages buyers and influences the buying decision. The pop-up solution developed is unique and the pack offers choice and opportunity to upsell from the basic range. The space planner with its pop-out interiors includes the buyer in the design process of their space. Bespoke hand drawn illustrations and infographics, finished with the very latest in soft touch lamination and foiling completes the high-quality feel. VI was appointed to design and develop The Green Retreats Website. The websites are developed with lifestyle in mind and incorporate an improved gallery to better display the product range. Green Retreats mission is to offer a transparent service, therefore, an interactive price grid that dynamically displays product features, images and prices supports direct product comparisons for all key buying considerations: cost, space and style. The business is experiencing rapid growth and increased market penetration. Its former web solution was dated and was unable to increase income and improve brand awareness. VI developed a modern fully responsive WordPress website that clarifies the buying decision and emulates a sales-driven web environment that attracts a wider audience and generates more enquiries. 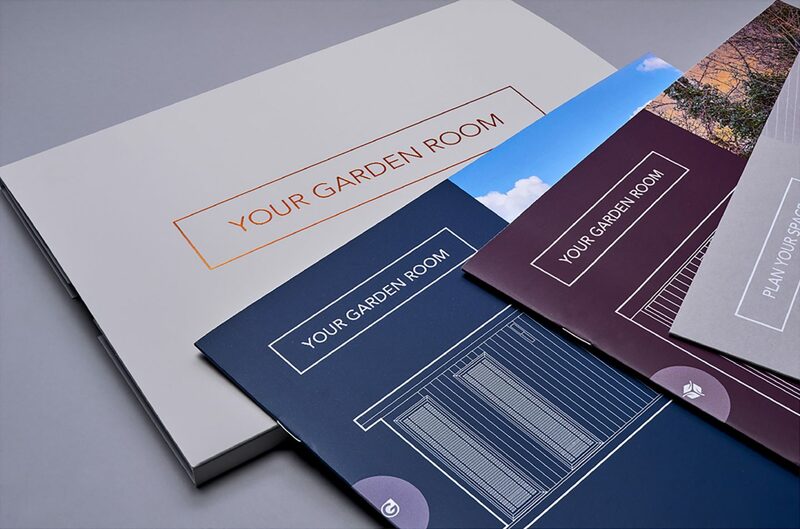 Green retreats have used all 8000 printed brochures within a 4 month period and has needed a reprint much earlier than expected.